Plasmids are small, double-stranded, circular pieces of DNA originally used by bacterial cells as a way to transfer traits, but are currently used in molecular biology to study individual genes. Plasmids are typically depicted as shown below as a circle of DNA called a vector containing a gene of interest (in green) called the insert. Click here to learn more about genes and here for some examples of what they are used for. Promoters: a section of sequence that initiates gene transcription. Terminators: a section or sequence that signals the end of transcription. Multiple cloning site: a sequence of nucleotides that enables researchers to insert their gene of interest into the plasmid. 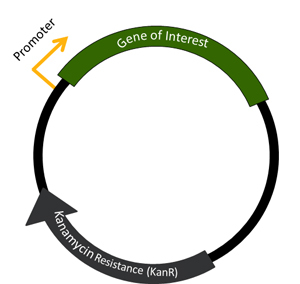 Selectable marker: a gene introduced into a plasmid that enables researchers to artificially select it, such a resistance to a certain antibiotic. Tags: either on the N-terminus or the C-terminus, that enable proteins produced to be visualized or purified. Gene of interest: the gene that expresses the protein to be studied. What is a gene and what does it do? DNA: DNA (deoxyribonucleic acid) is the blueprint that makes up the genetic instructions for all living organisms. DNA is made up of four bases called adenine (A), thymine (T), guanine (G) and cytosine (C) connected to one another in strands by a sugar and phosphate backbone. If you could zoom in and look at DNA, it looks like a twisted ladder that is called a double helix. In the ladder, the rungs are made up of bases connected to one another (A always binding to T and G always binding to C) and the sides of the ladder are the sugar and phosphate backbone. DNA is organized in a cell in chromosomes. In humans, there are 23 pairs of chromosomes. The whole set of chromosomes in an organism is called its genome. 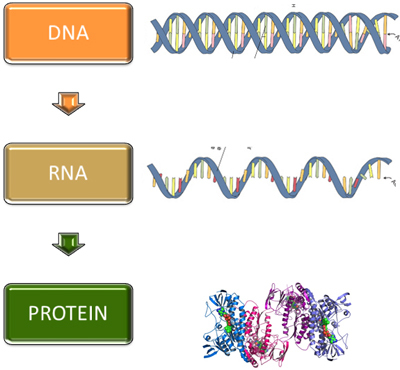 Genes and Proteins: Genes are sections of DNA on the chromosome that code for proteins. Proteins are responsible for the majority of the activities of a cell. An example of a familiar protein is insulin. This protein is produced by beta cells in the pancreas to process glucose. Synthetic insulin is often used to regulate glucose levels in people with Type I diabetes. Humans have about 20,500 protein coding genes in their genome. Making Proteins: To make a protein, the DNA is first transcribed into messenger RNA (mRNA), which contains A, C, G and uracil (U) instead of T. This is a single stranded molecule vs. the double-stranded DNA. Cells have a huge protein and RNA machine called the ribosome that can then "read" the mRNA and translate it into protein. It is called translation because the nucleotides that make up the DNA and RNA are translated into the alphabet of proteins, which are made up of amino acids. How does this apply to plasmids? Using various techniques, we can now isolate genes from any organism and put them into a vector, creating a plasmid. Depending on the features of the vector, the plasmid can then be used to make the protein that the gene encodes in order to study the function of the gene. See below for some of the uses of plasmids. What can plasmids be used for? Protein Function: Plasmids can be used to make the protein of interest in nearly any type of cell. If you are interested in studying whether a protein is involved in cancer, you may want to express it in human cells in culture and see if it makes the cells grow faster (a characteristic of cancer cells). You may already know the function of the protein, but you want to know precisely how it work, so you can change the DNA of the gene in the plasmid (by making a single mutation or removing whole pieces of the gene) and seeing how this affects it's activity. If a mutation inactivates an enzyme, then you may have isolated the part of the protein that catalyzes the reaction. Structure: The three dimensional (3D) folding of a protein (see the structure of a protein in the section above) is critical in determining both what a protein does and how it does it. Structural biologists, such as those in the Protein Structure Initiative use plasmids to make a lot of protein to be used to determine the 3D structure. Through collaborations with other researchers, these large quantities of protein can then be used in complementary experiments to study the function and activity of these proteins. Learn more about structural biology at the RSCB Protein Data Bank (PDB). Localization: Many times, knowing where a protein is located in a cell gives a clue as to what it might be doing. For example, a protein located within the mitochondria (an organelle that functions as the powerhouse for the cell) may be involved in making cellular energy. One way to follow where a protein is localized is to "tag" the protein with a molecule that glows such as Green Fluorescent Protein or GFP from the bioluminescent jellyfish Aequorea victoria. This tagged protein can be expressed in a cell and the localization visualized under a microscope. Bio marker Identification: In our center, we use plasmids to identify bio markers for the early detection of disease. 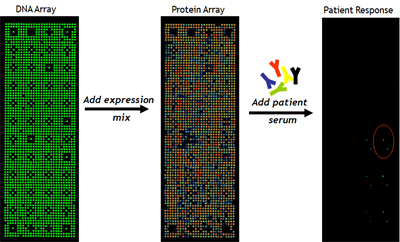 We study all proteins at one time (proteomics) using a protein array technology we developed called Nucleic Acid Programmable Protein Arrays (NAPPA). We spot over 2,000 plasmids onto glass slides, make protein via the process described above, and then use these slides to compare factors that bind to these slides in the serum of patients with a disease versus those without (see image for an example). The factors that bind in the patients with disease may be bio markers to detect that disease.